If you’re following us on our social media, you’ll already know that we’ve gone GDPR central from now till December! In our last post, we brought you the history of GDPR and its importance in modern day, so we thought this time to bring into the mix how and where we fit into all of this. Surprisingly the service we provide has a key role to play in the ever-approaching Data security new laws – GDPR. GDPR is going to be tougher than any previous Data security laws, no matter your organization type, where you operate from, if you process any EU Data the rules still apply. SO, WHERE DO WE AND RUBRIK COME ALONG INTO ALL THIS? 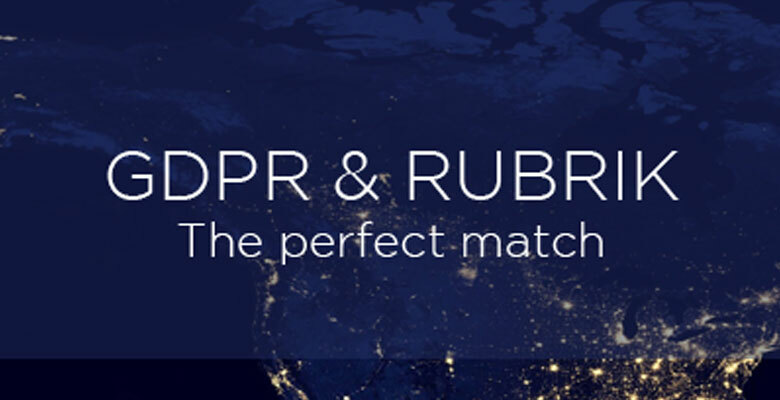 Through the Rubrik solution we aim to ease the process of what seems to be a never-ending line of hoops to jump through to compliance, as well as generally pointing you in the direction of useful hints to get you GDPR compliant. Now one of the most common obstacles that companies face is because they store their data in a fragmented way, scattered across different location on-premises and in the cloud. This overall makes it harder to comply with GDPR since pretty much every article centers around, in one way or another, always having access to the data you possess as well as being able to protect and keep an eye on it at all times. GDPR has a lot of requirements to meet but it’s hard to know how to resolve them, luckily, we have some wisdom to offer on how Rubrik could help. Article 5 – Companies need to be accountable for how they comply with Data Protection and privacy. This is easier to resolve than you think, simply by using Rubrik Envision companies can deliver custom visual reporting on compliance, capacity as well as retention. In a few clicks custom reports can be configured. Just as easy as the first, Rubrik can expedite data discovery for expiration through its global predictive search. Article 32 – All companies must assess the risks of processing as well as accessing personal data and implement measure to ensure an appropriate level of security is obtained. Rubrik expedites the recovery of data breaches, this includes the most common – Ransomware. Rubrik stores Data in an immutable format meaning that a company can swiftly recover without losing data or paying any ransom. So there you have it, simple solutions to some of the biggest GDPR obstacles! But if you feel that you’re wanting more, try Rubrik’s latest GDPR checklist and get yourself compliant ready. See how Assured DP can help you introduce Rubrik into your organization. To request a demo or more information talk to a member of the team on 0800 061 4298 if you’re based in the UK or +1 (703) 225-3385 if you’re in the US. This entry was posted in GDPR and tagged Assured DP, Backup, Data Protection, GDPR, Rubrik. Another award goes to Rubrik!